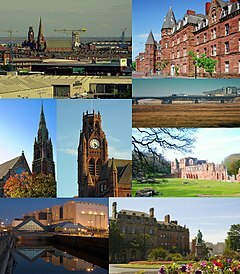 Barrow-in-Furness ( /ˈbæroʊ ɪn ˈfɜːrnəs/ BA-roh in FUR-nəs; commonly known as Barrow) is a town and borough in Cumbria, North West England. Historically part of Lancashire, it was incorporated as a municipal borough in 1867 and merged with adjacent districts in 1974 to form the Borough of Barrow-in-Furness. At the tip of the Furness peninsula, close to the Lake District, it is bordered by Morecambe Bay, the Duddon Estuary and the Irish Sea. In 2011, Barrow's population was 57,000, the second largest urban area in Cumbria after Carlisle. Natives of Barrow, as well as the local dialect, are known as Barrovian. In the Middle Ages, Barrow was a small hamlet with Furness Abbey, on the outskirts of the modern-day town, controlling the local economy before its dissolution in 1537. The iron prospector Henry Schneider arrived in Furness in 1839 and, with other investors, opened the Furness Railway in 1846 to transport iron ore and slate from local mines to the coast. Further hematite deposits were discovered, of sufficient size to develop factories for smelting and exporting steel. By the late 19th century, the Barrow Hematite Steel Company-owned steelworks was the world's largest. Barrow's location and the availability of steel allowed the town to develop into a significant producer of naval vessels, a shift that was accelerated during World War I and the local yard's specialisation in submarines. The original iron- and steel-making enterprises closed down after World War II, leaving Vickers shipyard as Barrow's main industry and employer. Several Royal Navy flagships, the vast majority of its nuclear submarines as well as numerous ocean liners and oil tankers were manufactured at the facility. The end of the Cold War and subsequent decrease in military spending saw high unemployment in the town through lack of contracts; despite this, the BAE Systems shipyard remains operational as the UK's largest by workforce and is undergoing a major expansion associated with the Dreadnought-class submarine programme. Today Barrow is a hub for energy generation and handling. Offshore wind farms form one of the highest concentrations of turbines in the world. The name was originally that of an island, Barrai, which can be traced back to 1190. This was later renamed Old Barrow, recorded as Oldebarrey in 1537, and Old Barrow Insula and Barrohead in 1577. The island was then joined to the mainland and the town took its name. The name itself seems to mean "island with promontory", combining British barro- and Old Norse ey, but it is more likely that Scandinavian settlers simply accepted barro- as a meaningless name, and so added an explanatory Old Norse second element. In the late 19th and early 20th centuries, Barrow was nicknamed "the English Chicago" because of the sudden and rapid growth in its industry, economic stature and overall size. More recently the town has been dubbed the "capital of blue-collar Britain" by the Daily Telegraph, reflecting its strong working-class identity. Barrow is also often jokingly referred to as being at the end of the longest cul-de-sac in the country because of its isolated location at the tip of the Furness peninsula. In 2014, Barrow was voted the least happy area to live in Britain in a survey by the Office for National Statistics. Barrow and the surrounding area has been settled non-continuously for several millennia. There is evidence of Neolithic inhabitants on Walney Island, and the Furness Hoard discovery of Viking silver coins and other artefacts in 2011 provided significant archaeological evidence of Norse settlement in the early 9th century. Several areas of Barrow including Yarlside and Ormsgill, as well as "Barrow" and "Furness", have names are of Old Norse origin. The Domesday Book of 1086 recorded the settlements of Hietun, Rosse and Hougenai, which are now the districts of Hawcoat, Roose and Walney respectively. Despite a rich history of Roman settlement across Cumbria and the discovery of related artefacts in the Barrow area, no buildings or structures have been found to support the idea of a functioning Roman community on the Furness peninsula. In the Middle Ages the Furness peninsula was controlled by the Cistercian monks of the Abbey of St Mary of Furness, known as Furness Abbey. This was located in the "Vale of Nightshade", now on the outskirts of the town. Originally founded for the Savigniac order, it was built on the orders of King Stephen in 1123. Soon after the abbey's foundation the monks discovered iron ore deposits, later to provide the basis for the Furness economy. These thin strata, close to the surface, were extracted through open cut workings, which were then smelted by the monks. The proceeds from mining, along with agriculture and fisheries, meant that by the 15th century the abbey had become the second richest and most powerful Cistercian abbey in England, after Fountains Abbey in Yorkshire. The monks of Furness Abbey constructed a wooden tower on nearby Piel Island in 1212 which acted as their main trading point; it was twice invaded by the Scots, in 1316 and 1322. In 1327 King Edward III gave Furness Abbey a licence to crenellate the tower, and a motte-and-bailey castle was built. However Barrow itself was just a hamlet in the parish of Dalton-in-Furness, reliant on the land and sea for survival. Small quantities of iron and ore were exported from jetties on the channel separating the village from Walney Island. Amongst the oldest buildings in Barrow are several cottages and farmhouses in Newbarns (now a ward of the borough) which date back to the early 17th century; as well as Rampside Hall, a Grade I listed building and the best-preserved in the town from the 1600s. Even as late as 1843 there were still only 32 dwellings, including two pubs. In 1839 Henry Schneider arrived as a young speculator and dealer in iron, and he discovered large deposits of haematite in 1850. He and other investors founded the Furness Railway, the first section of which opened in 1846, to transport the ore from the slate quarries at Kirkby-in-Furness and haematite mines at Lindal-in-Furness and Askam and Ireleth to a deep-water harbour near Roa Island. The crucial and difficult link across Morecambe Bay between Ulverston and Carnforth on the main line was promoted, as the Ulverston and Lancaster Railway, by a group led by John Brogden and opened in 1857. It was promptly purchased by the Furness Railway. The docks built between 1863 and 1881 in the more sheltered channel between the mainland and Barrow Island replaced the port at Roa Island. The first dock to open was Devonshire Dock in 1867, and Prime Minister William Ewart Gladstone stated his belief that "Barrow would become another Liverpool". The increasing quantities of iron ore mined in Furness were then brought into the centre of Barrow to be transported by sea. The investors in the burgeoning mining and railway industries decided that greater profits could be made by smelting the iron ore and converting the resultant pig-iron into steel, and then exporting the finished product. Schneider and James Ramsden, the railway's general manager, erected blast furnaces at Barrow that by 1876 formed the largest steelworks in the world. Its success was a result of the availability of local iron ore and coal from the Cumberland mines and easy rail and sea transport. The Furness Railway, which counted local aristocrats William Cavendish, 7th Duke of Devonshire and the Duke of Buccleuch as investors, kick-started the Industrial Revolution on the peninsula. The railway brought mined ore to the town, where the steelworks produced large quantities of steel. It was used for shipbuilding, and derived products such as rails were also exported from the newly-built docks. In 1871 Barrow's population was recorded at 18,584 and in 1881 at 47,259, less than forty years after the railway was built. The majority of migrants originated from elsewhere in Lancashire although significant numbers settled in Barrow from Ireland and Scotland, which represented 11% and 7% of the local population in the 1890s. By the turn of the 20th century, the Scottish-born population had increased to form the highest portion anywhere in England. In an attempt to diversify Barrow's economy James Ramsden founded the Barrow and Calcutta Jute Company in 1870 and the Barrow Jute Works was soon constructed alongside the Furness Railway line in Hindpool. The mill employed 2,000 women at its peak and was awarded a gold medal for its produce at the 1878 Paris Exposition Universelle. The sheltered strait between Barrow and Walney Island was an ideal location for the shipyard. The first ship to be built, the Jane Roper, was launched in 1852; the first steamship, a 3,000-ton liner named Duke of Devonshire, in 1873. Shipbuilding activity increased, and on 18 February 1871 the Barrow Shipbuilding Company was incorporated. Barrow's relative isolation from the United Kingdom's industrial heartlands meant that the newly formed company included several capabilities that would usually be subcontracted to other establishments. In particular, a large engineering works was constructed including a foundry and pattern shop, a forge, and an engine shop. In addition, the shipyard had a joiners' shop, a boat-building shed and a sailmaking and rigging loft. During these boom years, Ramsden proposed building a planned town to accommodate the large workforce which had arrived. There are few planned towns in the United Kingdom, and Barrow is one of the oldest. Its centre contains a grid of well-built terraced houses, with a tree-lined road leading away from a central square. Ramsden later became the first mayor of Barrow, which was given municipal borough status in 1867, and county borough status in 1889. The imposing red sandstone town hall, designed by W.H. Lynn, was built in a neo-gothic style in 1887. Prior to this, the borough council had met at the railway headquarters: the railway company's control of industry extended to the administration of the town itself. The Barrow Shipbuilding Company was taken over by the Sheffield steel firm of Vickers in 1897, by which time the shipyard had surpassed the railway and steelworks as the largest employer and landowner in Barrow. The company constructed Vickerstown, modelled on George Cadbury's Bournville, on the adjacent Walney Island in the early 20th century to house its employees. It also commissioned Sir Edwin Lutyens to design Abbey House as a guest house and residence for its managing director, Commander Craven. By the 1890s the shipyard was heavily engaged in the construction of warships for the Royal Navy and also for export. The Royal Navy's first submarine, Holland 1, was built in 1901, and by 1914 the UK had the most advanced submarine fleet in the world, with 94% of it constructed by Vickers. Vickers was also famous for the construction of airships and airship hangars during the early 20th century. Originally constructed in a large shed at Cavendish Dock, production later relocated to Barrow/Walney Island Airport. HMA No. 1, nicknamed the Mayfly is the most notable airship to have been built in Barrow. The first of its kind in the UK it came to an untimely end on 24 September 1911 when it was wrecked by wind during trials. Well-known ships built in Barrow include the Mikasa, Japanese flagship during the 1905 Russo-Japanese War, the liner SS Oriana and the aircraft carriers HMS Invincible and HMAS Melbourne. It should also be noted that there was a significant presence of Vickers' armament division in Barrow with the huge Heavy Engineering Workshop on Michaelson Road supplying ammunition for the British Army and Royal Navy throughout both world wars. World War 1 brought significant temporary migration as workers arrived to work in the munitions factory and shipyard, with the town's population reaching to an estimated peak of around 82,000 during the War. Thousands of local men fought abroad during World War I, 616 were ultimately killed in action. During World War II, Barrow was a target for the German air force looking to disable the town's shipbuilding capabilities (see Barrow Blitz). The town suffered the most in a short period between April and May 1941. During the war, a local housewife, Nella Last, was selected to write a diary of her experiences on the home front for the Mass-Observation project. Her memoirs were later adapted for television as Housewife, 49 starring Victoria Wood. The difficulty in targeting bombs meant that the shipyards and steelworks were often missed, at the expense of the residential areas. Ultimately, 83 people were killed and 11,000 houses in the area were left damaged. To escape the heaviest bombardments, many people in the central areas left the town to sleep in hedgerows with some being permanently evacuated. Barrow's industry continued to supply the war effort, with Winston Churchill visiting the town on one occasion to launch the aircraft carrier HMS Indomitable. Besides the dozens of civilians killed during World War II, some 268 Barrovian men were also killed whilst in combat. Barrow's population reached a second peak in of 77,900 in 1951, however by this point the long decline of mining and steel-making as a result of overseas competition and dwindling resources had already begun. The Barrow ironworks closed in 1963, three years after the last Furness mine shut. The by then small steelworks followed suit in 1983, leaving Barrow's shipyard as the town's principal industry. From the 1960s onwards it concentrated its efforts in submarine manufacture, and the UK's first nuclear-powered submarine, HMS Dreadnought was constructed in 1960. HMS Resolution, the Template:Sclass, Template:Sclass and Template:Sclasss all followed. The last of these are armed with Trident II missiles as part of the British government's Trident nuclear programme. The end of the Cold War in 1991 marked a reduction in the demand for military ships and submarines, and the town continued its decline. The shipyard's dependency on military contracts at the expense of civilian and commercial engineering and shipbuilding meant it was particularly hard hit as government defence spending was reduced dramatically. As a result, the workforce shrank from 14,500 in 1990 to 5,800 in February 1995, with overall unemployment in the town rising over that period from 4.6% to 10%. The rejection by the VSEL management of detailed plans for Barrow's industrial renewal in the mid-to-late 1980s remains controversial. This has led to renewed academic attention in recent years to the possibilities of converting military-industrial production in declining shipbuilding areas to the offshore renewable energy sector. In a 2002 outbreak of legionellosis in the town, 172 people were reported to have caught the disease, of whom seven died. This made it the fourth worst outbreak in the world in terms of number of cases and sixth worst in terms of deaths. The source of the bacteria was later found to be steam from a badly maintained air conditioning unit in the council-run arts centre Forum 28. At the conclusion of the inquest into the seven deaths, the coroner for Furness and South Cumbria criticised the council for its health and safety failings. In 2006, council employee Gillian Beckingham and employer Barrow Borough Council were cleared of seven charges of manslaughter. Beckingham, the council senior architect was fined £15,000 and the authority £125,000. Following the trials the contractor responsible for maintaining the plant settled a £1.5 million claim by the Council for damages. The borough council was the first public body in the country to face corporate manslaughter charges. 2006 saw the construction of Barrow Offshore Wind Farm which has acted as a catalyst for further investment in offshore renewable energy. Ormonde Wind Farm and Walney Wind Farm followed in 2011, the latter of which became the largest offshore wind farm in the world. The three wind farms are located west of Walney Island and are operated primarily by DONG Energy, contain a total of 162 turbines and have a combined nameplate capacity of 607 MW providing energy for well over half a million homes. West of Duddon Sands Wind Farm was commissioned in 2014 and is currently the largest of the four wind farms. Barrow is the largest town in the Borough of Barrow-in-Furness and the largest settlement in the peninsula of Furness. The borough is the direct inheritor of the municipal and county borough charters given to the town in the late 19th century. Historically it is part of the Hundred of Lonsdale 'north of the sands' in the historic county boundaries of Lancashire. Since the local government reforms enacted in England in 1974 the town has been within the administrative county of Cumbria. It still forms a part of the Duchy of Lancaster. The Barrow-in-Furness Borough Council forms the 'lower' tier of local government under Cumbria County Council. Since the 2011 local election, the Labour Party has had overall control of the Borough council, while the Borough elected 10 Labour and 1 Conservative Party councillor at the 2013 Cumbria County election. The town, along with Walney Island, is unparished and forms the bulk of the wards which make the entire borough's area. The Mayor and Deputy Mayor of Barrow are elected annually, and hold the roles of chairman and Vice-Chairman of Barrow-in-Furness Borough Council. The borough and former county borough of Barrow-in-Furness have been served by 106 mayors, beginning with Sir James Ramsden in 1867 and continuing through to incumbent 2014 mayor Marie Derbyshire. The Barrow-in-Furness UK Parliament constituency first came into existence during the 1885 United Kingdom general election, with David Duncan of the Liberal Party becoming the first MP for the town. The seat was won by the Conservative Party in 1892, before being won for the first time by Labour in 1906. In the subsequent forty years the seat swung between Conservative and Labour, but since 1945 it has been generally considered a Labour safe seat. In 1983, the constituency was expanded to include several commuter towns such as Dalton-in-Furness and Ulverston and was renamed Barrow and Furness. It was subsequently won by the Conservatives, with the victory attributed to Labour's stance against the nuclear-powered submarines that were being constructed in Barrow. Following a change in Labour policy the party won Barrow and Furness in 1992. John Woodcock has been the MP for the constituency since the 2010 general election. Barrow is situated at the tip of the Furness peninsula on the north-western edge of Morecambe Bay, south of the Duddon Estuary and east of the Irish Sea. Walney Island, to the west of Barrow, surrounds the peninsula's Irish Sea coast and is separated from Barrow by the narrow Walney Channel. Both Morecambe Bay and the Duddon Estuary are characterized by large areas of quicksand and fast-moving tidal bores. Areas of sand dunes exist on coasts surrounding Barrow, particularly at Roanhead and North Walney. The town centre and major industrial areas sit on a fairly flat coastal shelf, with hillier ground rising to the east of the town, peaking at 94 metres (308 ft) at Yarlside. Barrow sits on soils deposited during the end of the Ice Age, eroded from the mountains of the Lake District National Park, 10 miles (16 km) to the north-east. Barrow's soils are composed of glacial lake clay and glacial till, while Walney is almost entirely made up of reworked glacial morraine. Beneath these soils is a sandstone bedrock, from which many of the town's older buildings are constructed. Barrow town centre is located to the north-east of the docks, with suburbs also extending to the north and east, as well as onto Walney. The towns of Dalton-in-Furness and Askam-in-Furness are the other sizable settlements of the Borough of Barrow-in-Furness. Barrow is the only major urban area in South Cumbria, with the nearest settlements of a similar size being Lancaster and Morecambe. Other towns nearby include Ulverston, Windermere, Grange-Over-Sands and Millom. The town is sheltered from the Irish Sea by Walney Island, a 14 mile (22.5 km) long island connected to the mainland by the bascule type Jubilee bridge. About 13,000 live on the isle's various settlements, mostly in Vickerstown, which was built to house workers in the rapidly expanding shipyard. Another significant island which lay in the Walney Channel was Barrow Island, but following the filling of the channel to create land for the shipyard it is now directly connected to the town. Other islands which lie close to Barrow are Piel Island, whose castle protected the harbour from marauding Scots, Sheep Island, Roa Island and Foulney Island. Barrow on the west coast of Great Britain has a temperate maritime climate owing to the North Atlantic Current and tends to have milder winters than central and eastern parts of the country. The town lies in Hardiness zone 9 and has an average yearly temperature of 10.4 °C. The Barrow council district, which includes adjacent urban areas, had a population of around 69,100 according to the 2011 census. This is 4% less than the 2001 figure of 71,900, and the highest percentage population loss in the country between 2001 and 2011. The Office for National Statistics states Barrow's population as being in long term decline with a projected population of around 65,000 by 2037. This is largely a result of negative net migration. The 2011 census states 96.9% of Barrow's population as White British, and ethnic minority populations in Barrow stood at 3.1%. Other ethnic groups in Barrow include Other White 1.3%, Asian 1.0%, Mixed Race 0.5%, Black 0.1%, Arab 0.1% and all other ethnic groups represented 0.1% of the population. The first people to settle in what is now Barrow were the Celts and Scandinavians followed by the Cornish. Most Barrovians however are descended from immigrants from Scotland, Ireland and other parts of England who arrived from the late 19th century onwards. Barrow has significant Chinese (in particular those originating from Hong Kong), Filipino, Indian, Thai and Kosovan communities as well as a Polish population which partly dates back to World War II, however in general Barrow has a much lower proportion of ethnic minorities than national average. Barrow's Chinese connections were the subject of a documentary on Chinese state television in 2014. The programme covered diplomat Li Hongzhang's fact finding mission to the town's steelworks and shipyard in 1896 as well as the 2012 discovery of a hoard of Chinese coins discovered in Barrow dated around a similar time that have been suggested as having been brought over by sailors or labourers. The Society for Anglo-Chinese Understanding is a charity with a branch based in Barrow that aims to develop relations with the British Chinese community and the general British population. It was established in 1975 and publishes the quarterly China Eye magazine. In 2011 93.2% of the borough's population was born in England, 2.6% in Scotland, 0.6% in Northern Ireland and 0.5% in Wales. 3.1% of the town's 2011 population were born elsewhere in the world, 1.3% of which were born in the European Union. The five most common foreign countries of birth were Poland, the Republic of Ireland, Germany, the Philippines and India. According to the 2011 census, 98.8% of Barrovians spoke English as a main language, although around 40 languages are spoken in the town with Polish, Chinese, and Tagalog prevailing as the second, third and fourth most common main languages (0.3%, 0.2% and 0.1% of the population respectively). Of the 797 Barrovians who had a main language other than English, 82.9% can speak English well to very well. In the 2011 census 70.7% of Barrow's population stated themselves as being Christian. People stating no religion or chose not to state totalled 28.4% combined. Other religious groups represented 0.9% of the population, with Islam and Buddhism prevailing as the first and second most common groups. Conishead Priory, the first Kadampa Buddhist centre in the west, is home to around 100 Buddhists and is located off the Barrow to Ulverston Coast Road within the South Lakeland district. Historically Barrow was home to a notable Ashkenazi Jewish community that peaked in size during the 1930s with a synagogue in the town. Despite this it closed in 1974 and only a dozen Jews were recorded by the 2011 census. Historically Barrow's economy was dominated by the manufacturing sector, with the Barrow Hematite Steel Company and Vickers Shipbuilding and Engineering being amongst the most important global companies in their respective fields during the 20th century. In the present day, manufacturing remains the largest employment sector in the town with BAE Systems being the single largest employer. However, like most of the UK, employment trends have greatly diversified since the 20th century and there are no other predominant employment sectors in Barrow. Barrow has played a vital role in global ship and submarine construction for over 125 years. Ottoman submarine Abdül Hamid was built in the town in 1886 and became the first submarine in the world to fire a live torpedo underwater, while oil tanker British Admiral became the first British vessel to exceed 100,000 tonnes when launched in 1965. The vast majority of all current and former Royal Navy submarines were constructed in Barrow as well as numerous Royal Navy Fleet Flagships. The BAE Systems Maritime – Submarines shipyard at Barrow is the largest in the UK by workforce ahead of BAE Systems Maritime – Naval Ships in Govan, Cammell Laird in Birkenhead and Harland and Wolff in Belfast. It was expanded in 1986 by construction of a new covered assembly facility, the Devonshire Dock Hall (DDH), completed by Alfred McAlpine, on land that was created by infilling part of the Devonshire Dock with 2.4 million tonnes of sand pumped from nearby Roosecote Sands. DDH is the tallest building in Cumbria at 51 m. With a length of 268 m (879 ft), width of 51 m (167 ft) and an area of 25,000 square metres (270,000 sq ft) it is one of the largest shipbuilding construction complex of its kind in Europe. The DDH provides a controlled environment for ship and submarine assembly, and avoids the difficulties caused by building on the slope of traditional slipways. Outside the hall, a 24,300 tonne capacity shiplift allows completed vessels to be lowered into the water independently of the tide. Vessels can also be lifted out of the water and transferred to the hall. The first use of the DDH was for construction of the Template:Sclasss, and later vessels of the Template:Sclass were also built there. The shipyard is currently constructing the Template:Sclasss, the first of which was launched on 8 June 2007. BAE Systems is currently studying the design of a new class of ballistic missile submarines. BAE Systems also has orders for submarine pressure domes for the Spanish Navy. The shipyard has been awarded contracts for the construction of submarines which will carry nuclear missiles in a successor programme to the current Vanguard-class containing the Trident system. BAE Systems is investing £300 million in Barrow's shipyard to construct buildings capable of manufacturing and assembling the new class of submarines. This major development is the largest in 25 years at the shipyard and will see thousands of new jobs created, further cementing its place as the UK's largest shipyard and one of the few to have seen continuous contracts since founding over a century ago. The most recent surface vessels to be constructed in Barrow were Template:Sclass tanker Wave Knight and Albion-class amphibious assault ships HMS Albion and HMS Bulwark in the early 2000s when the shipyard was part of BAE Systems Marine division. It also undertook fitting out and commissioning of helicopter carrier HMS Ocean in the mid-1990s after the ship was built by Kvaerner Govan in Glasgow. Associated British Ports Holdings owns and operates the Port of Barrow which can berth vessels up to 200 m (660 ft) long and with a draught of 10 m (33 ft). The four main docks include Buccleuch Dock, Cavendish Dock, Devonshire Dock and Ramsden Dock, with the latter handling almost all of the port's cargo. Buccleuch and Devonshire Docks are utilised primarily by BAE Systems, while Cavendish Dock the largest by surface area is now a reservoir. Principal traffic includes the export of condensate by-product from the production of gas at the Rampside Gas Terminal, wood pulp and locally quarried limestone which is exported to Scandinavia for use in the paper industry. The port, which has deep water access, also handles the shipment of nuclear fuels and radioactive waste for BNFL's nearby Sellafield plant. James Fisher & Sons, a service provider in all sectors of the marine industry and a specialist supplier of engineering services to the nuclear industry in the UK and abroad, was founded in Barrow in 1847. It is listed on the London Stock Exchange and is the largest company to have its headquarters situated in Cumbria. Annual revenue stood at £307 million in 2012 (up 15% from £268 million in 2011), as well as staff numbers standing at over 1,500 worldwide, with 120 of those in the Barrow headquarters. Numerous vessels are registered at the Port of Barrow, with the majority being owned by James Fisher & Sons and International Nuclear Services/Pacific Nuclear Transport Limited. In 1985, gas was discovered in Morecambe Bay, and to this day the products have been processed onshore at Rampside Gas Terminal in south Barrow. The complex is operated jointly by Centrica and ConocoPhillips. Directly adjacent to Rampside Gas Terminal is Roosecote Power Station which was the first CCGT power station to supply electricity to the United Kingdom's National Grid. Although originally coal-fired, the station became gas-fired until it was mothballed in 2015. Barrow and its wider urban area form part of 'Britain's Energy Coast', and has one of the highest concentrations of wind farms in the world, the vast majority are located offshore and have been built during the early 2010s. All four of these wind farms are located off the coast of Walney Island, including the 108 turbine West Duddon wind farm, 102 turbine Walney Wind Farm, 30 turbine Barrow Offshore Wind Farm and 30 turbine Ormonde Wind Farm. Walney Wind Farm was the largest offshore wind farm in the world upon completion, in 2015 it received Government consent to be trebled in size. DONG Energy and Scottish Power maintain a wind farm operations base with 30 full-time staff members at the Port of Barrow. Sellafield and Heysham nuclear power stations are also located within 25 miles (40 km) of Barrow. Although it is at the end of a peninsula, Barrow is only around 20 minutes from the Lake District, Barrow has been referred to as a "gateway to the lakes" and "where the lakes meets the sea", a status which could be enhanced by the new marina complex and planned cruise ship terminal. Barrow itself has several tourist attractions that support just over 1,000 jobs; the town saw a higher growth in tourist expenditure during the 2000s than Cumbria as a whole and had about 2.3 million overnight stays during 2008. Barrow's most popular free-entry tourist attraction is the Dock Museum. The museum tells the history of Barrow (including the steelworks industry, the shipyard and the Barrow Blitz), as well as offering gallery space to local artists and schoolchildren. It is built upon and around an old graving dock. Walney Island has two world-renowned nature reserves (the 130 hectare (0.5 sq mi) South Walney Nature Reserve and the 650 hectare (2.5 sq mi) North Walney Nature Reserve). Both nature reserves have Site of Special Scientific Interest designation, as do the Duddon Estuary and Sandscale Haws to the north of the borough. Barrow has a number of beaches which are popular in the summer with sunbathers, kitesurfers and caravanners. They include Earnse Bay, Biggar Bank, Roanhead and Rampside. The first two of these provide views of the Isle of Man and Anglesey on exceptionally clear days. The wider borough has more than 60 km of coastline. The Park Leisure Centre is a fitness suite with a pool, set in the 45-acre (18.2 ha) Barrow Park. The historic ruins of Furness Abbey and Piel Castle, which are both managed by English Heritage, are also popular tourist destinations. South Lakes Safari Zoo is one of Europe's leading conservation zoos and has been voted Cumbria's best tourist attraction in five non-consecutive years; it is in the borough of Barrow-in-Furness on the outskirts of Dalton. The zoo underwent a multi-million pound expansion during the mid-2010s. It now holds thousands of animals and covers an area of 51 acres (20.6 ha) making it one of the Northern England's largest such parks. Barrow has been described as the Lake District's premier shopping town, with 'big name shops mingling with small local ones'. The town centre is home to a large indoor market and Portland Walk Shopping Centre. Barrow has many retail and leisure parks for a town of its size, including Cornmill Crossing, Cornerhouse Retail Park, Hollywood Park, Hindpool Retail Park and Walney Road Retail Park. Between them they host a number of supermarkets, electrical, home furnishing, clothing and discount stores, gyms, restaurants and Cumbria's largest cinema. Other modern visitor attractions in Barrow include the growing leisure destination at James Freel Close (consisting of an indoor kart racing complex, bowling alley, indoor skate park, trampoline centre and gym), as well as 'Lazer Zone' in Hindpool Road's former Custom House and a similar lazer quest, 'escape room' and play centre in the former Hitchens Building on Buccleuch Street. Urban regeneration has been ongoing in Barrow since the 1990s. Portland Walk Shopping Centre opened in 1998 anchored by Debenhams as part of a major reconstruction of Barrow town centre. Around the same time the Hindpool Retail Parks and Dock Museum were constructed over various former industrial sites in Barrow, including the dry dock, the Barrow Jute Works and the Barrow Steel Works. Recent construction projects in the town also include the £43 million expansion of Furness College's Channelside campus, £22.5 million Furness Academy new build, £14.5 million central Barrow flood relief scheme, £8.5 million Barrow police station, £5 million town centre redevelopment scheme, £4 million Scottish Power Wind Farm operations centre as well as the North Central Renewal Area, shake up of the town's residential and retirement homes and a number of large-scale hotel schemes catering for the influx of contractors working for BAE Systems. The Waterfront is an ambitious ongoing £200 million Dockland regeneration project, which began in 2007. The project includes a new 'Barrow Marina Village' which will incorporate an £8 million 400-berth marina, 600 houses, restaurants, shops, hotels and a new state of the art bridge across Cavendish Dock. A large watersports centre is also proposed, with the possibility of a cruise ship terminal. Some cruise ships are already scheduled to dock in Barrow, mainly for tourists to visit the Lake District, although there is no official cruise ship terminal yet. Developments have stalled since 2010 when the Northwest Regional Development Agency was disbanded and essential government funding was lost. Despite this Barrow Borough Council has since purchased land needed to make the development a reality and currently controls 95% of the site. The executive director of the council has stated construction of the Waterfront could resume by 2017 as economic prospects improve and has pledged funds to conduct a market testing exercise. The allocation of Growth Deal investment (2014 - 2021) will make improvements to the Barrow Waterfront Enterprise Zone far more secure  In 2014 a £300 million investment into the shipyard was announced by BAE Systems, in anticipation of the new generation of UK nuclear submarines. Construction will take up to eight years and create thousands of new jobs at the shipyard thereafter. Amongst proposals are an extension to the DDH complex and new buildings in the central yard area off Bridge Road on Barrow Island (a site formerly mooted for a huge construction hall for the construction of Queen Elizabeth-class aircraft carrier sections which the yard failed to win contracts for), these will house pressure hull units ready for shot blasting and painting, and be a place for joining submarine equipment modules. Redevelopment of the 5.8 hectare central yard area commenced in 2016. It is to be dominated by the Central Yard Complex Facility which upon completion will measure 178 m (584 ft) long, 94 m (308 ft) wide and 41 m (135 ft) tall, only 10% smaller than the volume of the pre-expansion Devonshire Dock Hall. Other large scale developments associated with BAE include a 30,000 m2 (320,000 sq ft) logistics centre which was constructed in the Waterfront Business Park in 2015 and a 8,100 m2 (87,000 sq ft) central training facility which is proposed at Buccleuch Dock Road. Other major employers include the National Health Service, through Furness General Hospital, which employs 1,800 staff, the Kimberly Clark paper mill which has 400 employees, BAE Systems' Land and Armaments division, Furness Building Society which is one of the twenty largest of its kind, Cumbria County Council and Barrow Borough Council. Amongst many retailers that have established themselves in Barrow, the furniture store Stollers is noted as being one of the largest shops of its kind in the UK. According to the 2011 census, 78.2% of males aged 16–64 and females aged 16–59 in Barrow were economically active. This figure is higher than the North West and England average. 73.8% of the population was employed, which again is higher than regional and national average, the unemployment rate stood at 5.6% which is lower than both averages. Despite this the percentage of people claiming key benefits, which is independent of the unemployment figure is much higher than both averages at 21.0%, or almost a quarter of all Barrovians of a working age. The most common form of benefit received was the Incapacity Benefit claimed by 11.0% of the adult population, while 4.0% claimed Jobseeker's Allowance which is on par with national average. Below is a list of how many people were employed by certain sectors according to the 2011 census. Little change has occurred over the 10-year period since the previous census with Barrow still having a much higher percentage of workers in the manufacturing sector than national average, ranking third in 2011 behind Corby, Northamptonshire and Pendle, Lancashire. South West Cumbria has one of the UK's most self contained workforces and Barrow itself has the sixth lowest portion of people who travel outside of the country for work. In 2001, 76% of the working age population in Barrow commuted within 5 kilometres (3.1 mi) for work, when compared to the England average of 54%. A significant portion of the town's population are employed by the nearby Sellafield nuclear facility and the GlaxoSmithKline plant in Ulverston. Barrow's principal road link is the A590. This runs to Barrow from the M6 motorway via Ulverston, skirting the southern Lake District. Just north of Barrow is the southern end of the A595, linking the town to West Cumbria. The A5087 connects Barrow's southern suburbs to Ulverston via a scenic coastal route. Abbey Road is the principal road through central Barrow, whilst Walney Bridge connects Barrow Island to Walney Island. The possibility of a bridge link over Morecambe Bay is occasionally raised, and feasibility studies have been carried out. Bus services within the town are operated by Stagecoach North West. There is no specifically designated bus station, although many bus routes start and end near the town hall. The original bus station, since demolished, was known for its role in a 1970s television commercial for Chewits sweets. As well as local suburban and village services, longer distance buses run to Millom, Ulverston, Bowness, Windermere and Kendal. Barrow-in-Furness railway station provides connections to Whitehaven, Workington and Carlisle to the north, via the Cumbrian Coast Line, and to Ulverston, Grange-over-Sands and Lancaster to the east, via the Furness Line – both of which connect to the West Coast Mainline. Numerous daily trains run to Manchester. The station handles over 600,000 passengers annually. Barrow has a second railway station, Roose, which serves the suburb of the same name. Furness Abbey, Barrow's third main line station, closed in 1950. There was also a station on Barrow Island, for commuters between the shipyard and nearby towns served by the Furness Railway. This railway link was severed in 1966 when the famous cradle bridge across the docks was closed permanently for safety reasons. There were also stations at Piel, Rabbit Hill, Rampside, Ramsden Dock and Strand. Between 1885 and 1932, the Barrow-in-Furness Tramways Company operated a double-decker tram service over several miles, primarily around central Barrow, Barrow Island and Hindpool. Barrow/Walney Island Airport operates two Beechkraft Kingair B200 and one B250 aircraft which fly to various destinations across the UK every weekday, including Bristol, Glasgow, London and Manchester. It is owned and operated by BAE Systems (IATA airport code: BWF, ICAO: EGNL) and the longest runway is almost 4,000 feet (1,200 m) long. Manchester Airport is the closest major airport, with direct links to Barrow railway station and about two hours away by road. Despite being one of the UK's leading shipbuilding centres, the Associated British Ports' Port of Barrow is only a minor port. Historically, the Isle of Man Steam Packet and the Barrow Steam Navigation Company (a subsidiary of the Furness Railway and later London, Midland and Scottish Railway) operated a number of steamers and passenger ferry services between Rampside and Ramsden Dock and Ardrossan (Scotland), Belfast (Northern Ireland), Blackpool, Douglas (Isle of Man), Fleetwood and Heysham. All services had ceased operation by the mid-20th century. For a short period during the early 1880s transatlantic travel was possible from the town. The Anchor Line operated a fortnightly service utilising three of its steamships, Alexandria, Caledonia and Columbia, between Barrow and New York City via Dublin. There are proposals to construct a cruise ship terminal in Barrow as part of the Waterfront redevelopment project. Holker Street, the home of Barrow A.F.C. Main articles: Barrow A.F.C. and Holker Old Boys F.C. Barrow A.F.C. are in the Conference National division of English football. The team, founded in 1901, are nicknamed "the Bluebirds" and play their home games at the Holker Street stadium. The side were members of the Football League until they failed to be re-elected in 1972. In 1990, they won the FA Trophy beating Leek Town 3-0 in the final at Wembley Stadium, London. Twenty years later, on 8 May 2010, Barrow repeated the feat, beating Stevenage Borough 2-1 after extra time. Barrow A.F.C. was bought by Texas-based businessman Paul Casson in 2014 with a 5-year plan of returning the team to the football league and completely redeveloping Holker Street, including the addition of three new stands. Football players born in Barrow include England internationals Emlyn Hughes and Gary Stevens, as well as Harry Hadley, and Vic Metcalfe. Of current professional footballers, Wayne Curtis, Morecambe striker, and Iran Under-20 and Hibernian winger Shana Haji both hail from the town. Holker Old Boys F.C., based at Rakesmoor Lane, are the town's second most successful football team, and they play in the North West Counties Football League Division One. Rugby league is a well-established sport and the town is considered as one of the game's traditional heartlands at professional and amateur levels. The professional team, Barrow Raiders, whose home games are at Craven Park, played in the Championship until 2011 but as of 2012, they now operate in the league below, known as Championship One. In the 1950s the side played in three Challenge Cup finals, winning the last of these against Workington Town. In the 1997 reorganisation of the sport the original Barrow RLFC team merged with Carlisle Border Raiders to form Barrow Border Raiders, with the word "border" later dropped. Players who were born in the town and played at a professional level include brothers Ade and Mat Gardner and Willie Horne. The latter captained Barrow to their Challenge Cup victory and represented Great Britain at an international level. He was inducted into the "Barrow Hall of Fame" along with former Barrow players Phil Jackson and Jimmy Lewthwaite. Barrow is home to two large golf clubs. Barrow Golf Club, founded in 1922, is situated in Hawcoat and covers some 6,209 yards (5,678 m) with 18 holes. Furness Golf Club, founded in 1872, is the sixth oldest golf club in England and is possibly the more famous of the two. It is located on Walney Island, just 50 yards (46 m) from the Irish Sea. It also offers an 18-hole course, a shop and other facilities. The Furness Golf Centre is located on the outskirts of Barrow close to Roanhead and is home to a 14-bay driving range, golf shop, swing studio and the Fairway Hotel. The hoaxer Maurice Flitcroft, known as the "world's worst golfer" lived and worked in the town. Barrow has staged speedway racing at three venues since the pioneer days in the late 1920s. The first track was at Holker Street. This venue had a revival for a short spell in the early to mid-1970s being utilised by the short-lived Barrow Bombers. In 1930 the sport moved to Little Park but this a somewhat hazy venue. The sport had a revival in 1978 at Park Avenue Industrial Estate but this was relatively short lived. Barrow is home to the Walney Terriers American Football club, formed in 2011 the club originally trained at Memorial Fields on Walney Island before establishing training grounds elsewhere in Barrow and Ulverston. The Terriers play in the North West conference of the BAFA's National League alongside the likes of the Manchester Titans and Merseyside Nighthawks. One of the town's most notable annual sporting events is the Keswick to Barrow (K2B), a 40-mile (60 km) walking and running event that has taken place every year since 1967 between Keswick and Barrow. The event has raised millions for charity and regularly sees in excess of 3,000 participants. Barrow, although one of the country's smallest local authorities contains a wealth of natural and built heritage assets, which includes 274 Listed Buildings and four SSSIs. The 2015 Heritage Index formed by the Royal Society of Arts and the Heritage Lottery Fund placed the borough as seventh highest of 325 English districts with especially high scores relating to nationally important landscape and natural heritage assets and industrial heritage assets. Barrow is one of Britain's few planned towns. The town centre is distinguished by its Victorian and Edwardian era civic buildings, such as the Town Hall, Main Public Library, former Technical School, former Central Fire Station, Salvation Army Building, Custom House, National Westminster Bank, The Duke of Edinburgh Hotel, St. George's Church, St. Mary's RC Church and St. James' Church. Oppositely, several distinctive buildings have been demolished in Barrow since the mid-20th Century as a result of neglect or war damage, amongst the most iconic are Abbots Wood, Barrow Central Railway Station, Infield House, North Lonsdale Hospital, Scotch Buildings and the Waverley Hotel. Lancaster architects Sharpe, Paley and Austin were prolific throughout the development of Barrow. A number of Barrow's landmark buildings were constructed from locally sourced sandstone, evident from the high number of brown and red coloured stone buildings in the town. Similar materials were used in a number of local buildings in the early 20th Century, and often accompanied by terracotta. There are also an increasing number of modern office buildings as well as the shipyard's construction halls which dominate much of Barrow's skyline. Despite much of Barrow having been constructed from the late 19th to mid 20th centuries, architectural styles vary greatly across the town from the Art Deco John Whinnerah Institute to the Byzantine style St. John's Church, Neo-Elizabethan Abbey House and Tudor Revival Vickerstown estate. Barrow has 8 Grade I listed buildings, 15 Grade II* and 249 Grade II buildings. The majority of Grade I listed buildings and structures are in and around the Furness Abbey complex while many Grade II* listed buildings in the town are 19th century tenements on Barrow Island including the Devonshire Buildings. There are a number of Conservation Areas across Barrow named as such for their architectural or historical significance, they include Barrow Island, Biggar, Central Barrow, Furness Abbey, North Scale, North and South Vickerstown and St. George's Square. Historically Barrow's skyline was dominated by shipyard cranes and industrial chimneys, although little evidence of this remains in the present day with the last hammerhead crane – the iconic yellow crane of Buccleuch Dock – being dismantled in 2011, despite calls for listing status like the smaller Titan Clydebank in Glasgow. The tallest building in Barrow is Devonshire Dock Hall at 51 metres (167 ft). Also worth of note are the turbines of Ormonde Wind Farm located just off the coast of Barrow which stand at 152 metres (499 ft). In terms of housing, the majority of dwellings in Barrow are Victorian terraces. At 47.0% of local housing stock in 2011, the figure is much higher than England's average of 24.5%. 29.7% of dwellings are semi-detached, 12.09% detached and 10.2% flats, maisonettes or apartments. Great variety in housing styles is a feature across central Barrow, Barrow Island, Hindpool, and Vickerstown. Most were built around a grid design in accordance with plans drawn up by James Ramsden. Barrow has produced several musical performers of note. They include Thomas Round, a singer and actor in D'Oyly Carte productions of Savoy Opera as well as Glenn Cornick, the original bass guitarist in the rock band Jethro Tull. Paul MacKenzie, bass player with 1980s Preston-based thrash metal band Xentrix, is from Barrow. More recently, hip-hop DJ and record producer Aim has had considerable commercial success. Several notables in Art and Literature have come from Barrow. Artist Keith Tyson, the 2002 Turner Prize winner, was born in nearby Ulverston, attended the Barrow-in-Furness College of Engineering and worked at the then VSEL shipyard. Constance Spry, the author and florist who revolutionised interior design in the 1930s and '40s, moved to the town with her son Anthony during World War I to work as a welfare supervisor. Peter Purves, later a Blue Peter presenter, began his acting career with 2 years as a member of the Renaissance Theatre Company at the town's Her Majesty's Theatre. During the mid-20th century, Barrow contained a wealth of theatres/cinemas including the Coliseum, Electric Theatre, Essoldo, Her Majesty's Theatre, Hippodrome, Pavilion, Ritz, Roxy, Royalty Theatre and Tivoli. All but the Pavilion and Roxy have since been demolished, most recently in 2004 with the demolition of the Apollo (formerly the Ritz). The Canteen Media & Arts Centre – known simply as "The Canteen" – and The Forum are now the main venues for theatre, while the Vue Cinema in Hollywood Park is the only cinema in the town. In fictional works, Barrow and Vickerstown on Walney Island featured in children's show The Railway Series, which developed into Thomas the Tank Engine, as the point where the fictional Island of Sodor connected to mainland Britain and the national rail network. A number of the Lake Poets have referred to locations in present day Barrow, with one notable example being William Wordsworth's 1805 autobiographical poem The Prelude which describes his visits to Furness Abbey. The Portuguese poet Fernando Pessoa wrote a series of sonnets called "Barrow-on-Furness" (sic). His "heteronym" Álvaro de Campos lived in Barrow when he was studying ship engineering, but Pessoa himself had never visited, and mistakenly assumed that "Furness" was the name of a river. According to narrative exposition in Chapter five of Dorothy L. Sayers' 1926 novel Clouds of Witness, Inspector Charles Parker, Lord Peter Wimsey's friend and eventual brother-in-law, attended Barrow-in-Furness Grammar School. Renowned novelist D. H. Lawrence was in Barrow during the outbreak of World War I and wrote about his experiences in the town. The 2015 novel Career of Evil by J. K. Rowling's pseudonym Robert Galbraith was largely set in Barrow. There is one paid-for evening daily paper, the North West Evening Mail. There is also a weekly freesheet called the Advertiser, which is delivered to most households in the Furness area. Both are owned by independent publisher the CN Group, formerly Cumbrian Newspapers. Barrow is served by one commercial radio station, The Bay, which is broadcast from Lancaster and serves the area around Morecambe Bay. Another commercial station, Abbey FM, ceased broadcasting in February 2009 when it went into administration. The BBC's local radio service is BBC Radio Cumbria, who have studio facilities in the town. Barrow lies in the Granada TV – North West England region with the main signal coming from the Winter Hill transmitter near Bolton. There is also a relay transmitter at Millom whose signal can be received in the northern end of the town. Various television personalities were born in the district. Dave Myers was a biker born in Barrow, before he found fame as one half of television cookery duo the Hairy Bikers. Karen Taylor is a TV comedian best known for her BBC Three sketch show Touch Me, I'm Karen Taylor. Steve Dixon is a newsreader for Sky News, while Nigel Kneale was a well-known film and television scriptwriter. The UK's top Thai demo chef and celebrity 'Chef Ooy' has also lived and worked in Barrow for the last 25 years. Wartime diarist and local housewife Nella Last's memoirs were adapted for television, with parts of the town used in filming. The resulting programme, Housewife, 49, written by and starring comedian Victoria Wood, was broadcast by ITV in 2006. It won two BAFTA awards – one for Best Single Drama, the other for Best Actress (Victoria Wood). CITV children's show The Treacle People had two villains named Barrow and Furness. Myles Wright also was born in Barrow and lived in the nearby village of Marton. Barrow-in-Furness is also the connection between the fictional Island of Sodor in the Thomas the Tank Engine TV series as well as the Railway Series books by the Rev. W. Awdry of which the TV series is based. Furness is unique within Cumbria and the local dialect and accent is fairly Lancashire-orientated. Until 1974 Furness was an exclave of Lancashire. As with Liverpool for example however, the Barrovian dialect has been influenced by large numbers of settlers from various regions. During the town's rapid growth from 1860 onwards, thousands came to Barrow from Scotland, Ireland, Wales and elsewhere in northern England. As Glaswegian and Geordie dialects mingled in Barrow numerous more migrated from Lancashire and other parts of England which in effect created the noticeably Northern Barrovian dialect. In general the Barrovian accent tends to drop certain letters (including H and T). There are countless pubs and working men's clubs located across Barrow. Barrow has fourteen of the latter, one of the highest number per capita of any British town. There are also many bars and clubs found primarily in Barrow town centre on Duke Street and Cornwallis Street. Popular venues on Duke Street include the following bars: Jefferson's, the Buddha Bar, Bar Cairo and the Drawing Room. They did have a Yates's but the building was deemed unsafe and has since been demolished. Cornwallis Street – often dubbed the "Gaza Strip" by locals – is currently undergoing a multi-million pound renovation with the former Martini's being the flagship renovation into Club M. Other clubs on Cornwallis Street include: Kavanna's, O'Sullivan's and Skint. Between 2004 and 2010 Barrow was home to one of North West England's largest nightclubs, the 2,500 capacity Blue Lagoon occupied the entire hull of the former Danish ferry Princess Selandia which has now left the town. Barrow's largest nightclub is now Manhattans which opened on Cavendish Street in late 2011. It is often full of men with "Barry McGuigan" syndrome who are all tanned to bits with a very low IQ. On the alternative end of the spectrum you will find the "Bezza" otherwise the Strawberry pub, this is where dreams are made. A little known fact about the Strawberry is that this is actually the place that Winston Churchill along with the landlord 'Big Nige' actually came up with the D day plans that later turned around the war effort. A traditional favourite food in Barrow is the pie and particularly the meat and potato pie. Pie shops are common, and Green's of Jarrow Street is noted as a favourite of Barrow-born celebrity chef Dave Myers  and journalist Martin Tarbuck who declared them to be Britain's best pies in a book dedicated to the subject. Barrow was also the home of soft-drink company Marsh's, which produced a distinctive sarsaparilla flavoured fizzy drink known as Sass. Marsh's was purchased by Purity Soft Drinks of Birmingham in 1993, and the company stopped producing Sass in 1999. Remaining bottles have subsequently sold for high prices as a collector's item. A new product, labelled "Barrow Sass", was launched in 2014 in a bid to replicate traditional Sass. The coasts around Barrow have rich cockle beds from which cockles have traditionally been gathered, although numbers have been low following intensive gathering during the early 2000s, in the run up to the 2004 Morecambe Bay cockling disaster. One of England's few remaining Oyster farms can also be found located in the Biggar area of Walney. Traditional Cumberland sausages are less associated with Barrow itself than the rest of Cumbria, but are readily available from the surrounding rural area. Cumbria has produced a number of famed dishes and is home to countless Michelin Guide restaurants, one of which is located in Dalton. Having emerged as mixture of working class cultures from across Britain and Ireland in the 19th Century, subsequent low levels of migration and a continued tradition of industrial employment mean that Barrow's culture still reflects many of the traditions of the British Working Class. In September 2008, Barrow was named as the most working class location in the United Kingdom, based on a series of measures devised to judge the lifestyle of the people. The research was carried out by Locallife.co.uk which determined that there is a fish and chip shop, working men's club, bookmakers or trade union office for every 2,917 people (Crewe, Doncaster, Wolverhampton and Preston completed the top five of 'the most working class places in Britain'). This is in direct contrast to the 1870s when a developing Barrow had more aristocrats per head of the population than anywhere else in the country. In the 2015 Indices of Deprivation, Barrow was ranked as the 44th most deprived district in England (out of a total of 326). The equivalent figures for 2007 and 2010 stood at 29th most deprived and 32nd most deprived respectively. The Indices of Deprivation is based on income, employment, education, health, crime and barriers to housing and services and living environment. Within these subcategories, most notably Barrow ranked as the 5th most deprived in terms of health deprivation and disability, and in huge contrast, 324th most deprived in terms of access to housing and services (i.e. 3rd least deprived). In the 2010 Indices of Deprivation, the majority of areas in Barrow Island, Central, Hindpool, Ormsgill were amongst the 3% most deprived areas in the country, while large parts of suburban Barrow including Newbarns and Roose were amongst the 25% of least deprived areas in England. The principal hospital in Barrow is Furness General Hospital which is operated by the University Hospitals of Morecambe Bay NHS Trust and located on the outskirts of the town. As of July 2010 there are 12 NHS GP practices/doctors surgeries and 5 NHS dental surgeries in Barrow. The average life expectancy for males in Barrow is 76.0 years (compared to England average of 77.7) and 80.9 years for females (again compared to national average of 81.8). The 2001 UK Census showed that 63.12% of Barrovians were in good health, 23.63% in fairly good health and 13.25% in bad health. This compared to England's averages of 68.76%, 22.21% and 9.03% respectively show that in general people in Barrow are in a slightly worse state of health than England as a nation. A 2009 NHS in depth publication of health in Barrow indicated that, eight years later the population of Barrow despite becoming healthier is still worse off than national average. The opening statement of the publication read 'The health of people in Barrow-in-Furness is varied. Many indicators are significantly worse than the England average, including violent crime and binge drinking adults (an estimate). However, a number of indicators are similar to the average, such as GCSE achievement and healthy eating adults (an estimate), and a fifth of indicators are significantly better than average, including physically active children and adults.' Barrow has the tenth worst rate of Incapacity Benefit claimants for mental illness in the country. The NHS also identified Barrow as having significantly worse figures than England average in the fields of deprivation, child poverty, violent crime, breast feeding initiation, children's tooth decay, binge drinking adults, over 65s 'not in good health', hospital stays for alcohol-related harm, male and female life expectancy, deaths from smoking and early deaths from cancer. Despite this, as stated earlier the number of physically active children and adults in Barrow is significantly better than England average, whilst the town also has much lower numbers of drug misusers, diabetes sufferers and road accident injuries and deaths. All other aspects of the health of Barrow's population have been stated as more or less level with nationwide average. Law enforcement in Barrow is upheld by Cumbria Constabulary which alongside the county of Cumbria were formed in 1974. Prior to this the town was policed by Barrow-in-Furness Borough Police. Barrow currently has one full-time police station located on Market Street in the Central ward. A new multi-million pound building is however being constructed on James Freel Close on Channelside in Hindpool and will become the town's only police station upon completion, with extra jail cells and improved facilities. Several consecutive annual publications by Cumbria Constabulary titled the 'Cumbria Community Safety Strategic Assessment' have stated overall crime in Barrow to be on the decline with some indicators faring far better than national average. Despite this crime levels as a whole are higher than nationwide average with 2013 statistics stating crime levels in the borough as 16th worst in the UK with most notably Barrow having amongst the worst rates of alcohol misuse in the country. Between July and December 2013 Barrow saw an average of 7.39 crimes per 100 of the population, the UK average was 6.57. Incidents of anti-social behaviour stood at 7.83 per 100 in Barrow and 5.02 in the UK respectively also. Burglary averaged 0.53 per 100 in 2013 while nation average stood at 1.00 in 100. Robbery averaged 0.02 in Barrow and 0.07 nationwide, shoplifting 0.72 and 0.53 and vehicle crime at 0.31 and 0.58 respectively. Violent crimes and sexual offences occurred at a rate of 1.70 per 100, significantly higher than UK average of 1.06 and ranking the local authority 29th worst out of 348 in the country. Crime rates remain the highest in deprived areas of inner wards such as Central and Hindpool. Education in the state-funded sector includes fifteen primary schools, five infant schools, five junior schools and many nurseries. The three secondary schools in the town are: Furness Academy, St. Bernard's Catholic High School and Walney School. Chetwynde School is an all-through school for children aged 4 to 18. Formerly an independent school, Chetwynde became a state-funded free school in 2014. In the further education sector there are two colleges. Barrow-in-Furness Sixth Form College concentrates on teaching A-level subjects, while Furness College specialises in vocational courses. Although there is no higher education institution based in Barrow, Furness College teaches several foundation degrees and a small number of Bachelor's and Master's programmes accredited by the University of Cumbria, University of Lancaster and the University of Central Lancashire. The town's main library is the Central Library in Ramsden Square, situated near the town centre. The library was established in 1882 in a room near the town hall, and moved to its current premises in 1922. A branch of the County Archive Service, opened in 1979 and containing many of the town's archives, is located within adjoining premises, whilst until 1991 the library also housed the Furness Museum, a forerunner of the Dock Museum. Smaller branch libraries are currently provided at Walney, Roose and Barrow Island. Wikivoyage has a travel guide for Barrow-in-Furness. Wikisource has the text of the 1911 Encyclopædia Britannica article Barrow-in-Furness. ^ Jenkins, Russell (22 December 2006). "Chocolate blog sends town into meltdown": 15. ^ a b "Appendix on unemployment as part of report into British Aerospace PLC proposed merger with VSEL" (PDF). Competition Commission. 23 May 1995. Archived from the original on 28 September 2007. http://www.competition-commission.gov.uk/rep_pub/reports/1995/fulltext/365a4.8.pdf. Retrieved 31 August 2007. ^ World's biggest offshore wind farm opens off Britain as new minister admits high cost The Telegraph, 9 February 2012. Accessed: 9 February 2012. ^ Mills, David (1976). The Place Names of Lancashire. London: Batsford Books. ISBN 0-7134-3248-9. ^ "Roman Treasure". Dock Museum. http://www.dockmuseum.org.uk/Romans. Retrieved 3 August 2015. ^ "Local history and heritage". Barrow Borough Council. Archived from the original on 9 June 2007. http://www.barrowbc.gov.uk/Default.aspx?page=150#abbey. Retrieved 10 June 2007. ^ "Iron Mining". Industries of Cumbria. Archived from the original on 2 July 2007. http://www.cumbria-industries.org.uk/ironmining.htm. Retrieved 10 June 2007. ^ Raymond, Michael. "A Forgotten Medieval Powerhouse: Furness Abbey". New Histories Magazine. http://newhistories.group.shef.ac.uk/wordpress/wordpress/a-forgotten-medieval-powerhouse-furness-abbey/. Retrieved 3 August 2015. ^ English Heritage. "Furness Abbey". English Heritage. http://www.english-heritage.org.uk/server/show/ConProperty.149. Retrieved 6 May 2007. ^ "Plan of Barrow 1843" (PDF). Barrow Borough Council. Archived from the original on 4 July 2007. http://www.barrowbc.gov.uk/pdf/summary%20of%20plan%20areas.pdf. Retrieved 10 June 2007. ^ a b "History of the Furness Railway Company". The Furness Railway Trust. Archived from the original on 15 July 2007. http://www.furnessrailwaytrust.org.uk/frco.htm. Retrieved 8 July 2007. ^ Marshall, J.D. (1981) . Furness and the Industrial Revolution. Michael Moon, Beckermet, Cumbria. pp. 215–8. ISBN 0-904131-26-2. ^ Richardson, Joseph (1870). Furness Past and Present. 1 of 2. pp. 18–24. ^ "Barrow". Ironbridge Gorge Museum Trust. Archived from the original on 19 August 2007. http://www.ironbridge.org.uk/about_us/ironbridge_archaeology/projects/barrow/. Retrieved 25 August 2007. ^ a b c d "Barrow in Furness: A Population Study". Economic Geography 15 (4): 379–383. ^ "Timeline History of Barrow-in-Furness". VisitorUK. http://www.visitoruk.com/Barrow-in-furness/19th-century-T454.html. Retrieved 16 July 2015. ^ "Culture, Conflict, and Migration: The Irish in Victorian Cumbria". Liverpool University Press. https://books.google.co.uk/books?id=4w5jOmmHagAC&source=gbs_navlinks_s. Retrieved 6 April 2015. ^ "The Scots in Victorian and Edwardian Belfast: A Study in Elite Migration". Oxford University Press. https://books.google.co.uk/books?id=jI6lBgAAQBAJ&printsec=frontcover#v=onepage&q&f=false. Retrieved 1 April 2015. ^ "Barrow Flax and Jute Co". Grace's Guide. http://www.gracesguide.co.uk/Barrow_Flax_and_Jute_Co. Retrieved 10 March 2013. ^ The Naval and Armaments Company Limited (1896). The Works at Barrow-in-Furness of The Naval Construction and Armaments Company Limited – Historical and Descriptive. Barrow-in-Furness: The Naval and Armaments Company Limited, partly reprinted from 'Engineering' magazine. p. 54. ^ "Former Mayors". Borough of Barrow-in-Furness. http://www.barrowbc.gov.uk/council-democracy/mayor/former-mayors/. Retrieved 3 August 2015. ^ "History of Dalton-in-Furness". Dalton Online. Dalton Community Association. Archived from the original on 10 August 2007. http://www.dalton-in-furness.org.uk/dalton-online/history/modern-town/modern-town-localgov.html. Retrieved 6 July 2007. ^ "Local History and Heritage". Barrow Borough Council. Archived from the original on 9 June 2007. http://www.barrowbc.gov.uk/Default.aspx?page=150. Retrieved 8 July 2007. ^ Partridge, Frank (16 March 2006). "The Complete Guide to: England's Islands". The Independent (London: Independent News & Media). Archived from the original on 27 September 2007. https://web.archive.org/web/20070927211406/http://travel.independent.co.uk/uk/article351869.ece. Retrieved 10 August 2007. ^ "Homepage". Abbey House Hotel. http://www.abbeyhousehotel.com/. Retrieved 3 August 2015. ^ "Submarine History of Barrow-in-Furness". Submarine Heritage Centre. Archived from the original on 4 July 2007. https://web.archive.org/web/20070704042341/http://www.submarineheritage.com/history.html. Retrieved 20 July 2007. ^ "The Battle of Britain – Diary – 2 September 1940". RAF. 16 February 2005. Archived from the original on 15 August 2007. http://www.raf.mod.uk/bob1940/september2.html. Retrieved 5 August 2007. ^ "World War II" (PDF). Dock Museum. 16 February 2005. http://www.dockmuseum.org.uk/docs/Publication%20world%20war%20II-web.pdf. Retrieved 25 August 2007. ^ Freeman, TW (1966). The Conurbations of Great Britain (Second ed.). Manchester: The University Press. p. 239. ^ "Project Corus (Workington) Steering Group Report" (DOC). Northwest Development Agency. 1 June 2005. Archived from the original on 28 September 2007. http://www.nwda.co.uk/docs/Project_Corus_July05.doc. Retrieved 31 August 2007. ^ "Barrow Steel". Archived from the original on 2 July 2007. http://www.banklands.com/Barrow%20Steel.htm. Retrieved 21 July 2007. ^ Maggie Mort (2004). "Defence and the decline of UK mechanical engineering – the case of Vickers at Barrow". Business History 46 (1): 1–22. DOI:10.1080/00076790412331270099. ^ (23 May 1995) "Views of main parties as part of report into British Aerospace PLC proposed merger with VSEL" (PDF). ^ Mort, Maggie (2002). Building the Trident Network. MIT Press. ISBN 0-262-13397-0. ^ Schofield, Steven (January 2007). "Oceans of Work: Arms Conversion Revisited" (PDF). British American Security Information Council. Archived from the original on 10 July 2007. https://web.archive.org/web/20070710111238/http://www.basicint.org/nuclear/beyondtrident/oceans.pdf. Retrieved 25 August 2007. ^ "Legionnaires' source officially traced". BBC News. 20 August 2002. Archived from the original on 14 August 2003. https://web.archive.org/web/20030814170447/http://news.bbc.co.uk/1/hi/england/2205186.stm. Retrieved 21 July 2003. ^ "A Total Shambles". North West Evening Mail. 12 June 2007. Archived from the original on 23 June 2007. https://web.archive.org/web/20070623083652/http://www.nwemail.co.uk/news/viewarticle.aspx?id=508368. Retrieved 21 July 2007. ^ "Bug Death Council Worker Cleared". BBC News. 31 July 2006. http://news.bbc.co.uk/1/hi/england/cumbria/5232086.stm. Retrieved 21 July 2007. ^ "Back in the Line of Fire". publicfinance.co.uk. Archived from the original on 6 October 2007. https://web.archive.org/web/20071006125830/http://www.cipfa.org.uk/publicfinance/features_details.cfm?News_id=24043. Retrieved 21 July 2007. ^ "Cumbria's Population in Urban Areas 2003" (XLS). Cumbria County Council. http://www.cumbria.gov.uk/elibrary/view.asp?ID=6027. Retrieved 11 December 2006. ^ a b "Barrow Borough Council – Former Mayors". Barrow Borough Council. Archived from the original on 28 September 2007. http://www.barrowbc.gov.uk/default.aspx?page=2490. Retrieved 18 August 2007. ^ "Lancashire AncC: Historical Boundaries". A Vision of Britain Through Time. Archived from the original on 1 October 2007. https://web.archive.org/web/20071001001412/http://www.visionofbritain.org.uk/bound_map_page.jsp?first=true&u_id=10173000&c_id=10001043. Retrieved 9 March 2007. ^ "Draft Statutory Instrument 2004 The Regional Assembly and Local Government Referendums (Date of Referendums, Referendum Question and Explanatory Material) (North West Region) Order 2004". Office of Public Sector Information. Archived from the original on 1 October 2007. http://www.opsi.gov.uk/SI/si2004/draft/20049539.htm. Retrieved 18 August 2007. ^ "Barrow Borough Council – Mayor's Role". Barrow Borough Council. http://www.barrowbc.gov.uk/council-democracy/mayor/mayors-role/. Retrieved 3 September 2011. ^ a b "Barrow & Furness". UK Polling Report. http://ukpollingreport.co.uk/2015guide/barrowandfurness/. Retrieved 16 September 2013. ^ May, VJ. "Walney Island". DEFRA. http://jncc.defra.gov.uk/pdf/gcrdb/GCRsiteaccount2042.pdf. Retrieved 16 July 2015. ^ a b (1999) "North Morecambe Terminal, Barrow: pile design for seismic conditions". Proceedings of the ICE - Geotechnical Engineering 137. Retrieved on 16 July 2015. ^ "Average Weather for Barrow-in-Furness". MSN.com. http://weather.uk.msn.com/local.aspx?&wealocations=wc%3aUKXX1577&setunit=F. Retrieved 3 August 2007. ^ "Census statistics for Barrow-in-Furness 2001". National Statistics. http://www.statistics.gov.uk/census2001/profiles/16uc.asp. Retrieved 11 May 2007. ^ "Table 2: 2012-based Subnational Population Projections for Local Authorities in England". Office for National Statistics. http://www.ons.gov.uk/ons/rel/snpp/sub-national-population-projections/2012-based-projections/rft-population-las.xls. Retrieved 20 August 2014. ^ a b "Ethnic Group, 2011 (QS201EW)". Office for National Statistics. http://www.neighbourhood.statistics.gov.uk/dissemination/LeadTableView.do?a=7&b=6275013&c=barrow&d=13&e=13&g=6411253&i=1001x1003x1004&m=0&r=1&s=1366140355413&enc=1&dsFamilyId=2575. Retrieved 16 April 2013. ^ a b "Links Between Barrow and China to be Featured in Film". in-cumbria.com. http://www.in-cumbria.com/links-between-barrow-and-china-to-be-featured-in-film-1.1100560. Retrieved 17 August 2014. ^ "Country of Birth (detailed), 2011 (QS203EW)". http://www.neighbourhood.statistics.gov.uk/dissemination/LeadTableView.do?a=7&b=6275013&c=barrow&d=13&e=13&g=6411253&i=1001x1003x1004&m=0&r=1&s=1366138221646&enc=1&dsFamilyId=2525. Retrieved 16 April 2013. ^ "Main Language (detailed), 2011 (QS204EW)". http://www.neighbourhood.statistics.gov.uk/dissemination/LeadTableView.do?a=7&b=6275013&c=barrow&d=13&e=13&g=6411253&i=1001x1003x1004&m=0&r=1&s=1366138221646&enc=1&dsFamilyId=2528. Retrieved 16 April 2013. ^ "Proficiency in English, 2011 (QS205EW)". http://www.neighbourhood.statistics.gov.uk/dissemination/LeadTableView.do?a=7&b=6275013&c=barrow&d=13&e=14&g=6411253&i=1001x1003x1004&m=0&r=1&s=1366143203704&enc=1&dsFamilyId=2500. Retrieved 16 April 2013. ^ "Religion, 2011 (KS209EW)". http://www.neighbourhood.statistics.gov.uk/dissemination/LeadTableView.do?a=7&b=6275013&c=barrow&d=13&e=14&g=6411253&i=1001x1003x1004&m=0&r=1&s=1366142319396&enc=1&dsFamilyId=2479. Retrieved 16 April 2013. ^ "Conishead Priory, Ulverston". AboutUlverston.co.uk. Archived from the original on 4 August 2007. http://www.aboutulverston.co.uk/location/conisheadpriory.htm. Retrieved 21 July 2007. ^ "Barrow-in-Furness Jewish Community & Synagogue". Jewish Communities and Records. http://www.jewishgen.org/jcr-uk/Community/barrow/. Retrieved 3 August 2015. ^ Taylor, Alison. "Marine Marvel". The Chartered Quality Institute. http://www.thecqi.org/Documents/community/Special-Interest-Groups/Defence/Marine_marvel_jul_07.pdf. Retrieved 3 August 2015. ^ BAE Systems. "Devonshire Dock Hall (DDH): One of the most advanced Shipbuilding Complexes in the World" (PDF). Retrieved on 3 June 2007. ^ "New UK nuclear submarine launched". BBC News. 8 June 2007. Archived from the original on 18 June 2007. https://web.archive.org/web/20070618113755/http://news.bbc.co.uk/1/hi/uk/6733777.stm. Retrieved 14 June 2007. ^ "BAE lands submarine export order". BBC News. 2 May 2007. Archived from the original on 5 June 2007. https://web.archive.org/web/20070605155840/http://news.bbc.co.uk/1/hi/business/6615139.stm. Retrieved 14 June 2007. ^ a b c d "Defence boom will create thousands of BAE jobs in Barrow". North West Evening Mail. http://www.nwemail.co.uk/News/Defence-boom-will-create-thousands-of-BAE-Systems-jobs-in-Barrow-f2441d1a-a8f9-401e-befd-67a5aa217b58-ds. Retrieved 13 March 2014. ^ "Port of Barrow". Associated British Ports. Archived from the original on 27 September 2007. http://www.abports.co.uk/custinfo/ports/barrow.htm. Retrieved 20 August 2007. ^ "Welcome to James Fisher". James Fisher official website. James Fisher and Sons. 2005. Archived from the original on 28 August 2007. http://www.james-fisher.co.uk/. Retrieved 30 August 2007. ^ MacIsaac, Mary (6 April 2003). "With a fair wind blowing there are profits to be made on the high seas". The Scotsman (UK). Archived from the original on 10 August 2007. https://web.archive.org/web/20070810073535/http://business.scotsman.com/topics.cfm?tid=895&id=401272003. Retrieved 30 August 2007. ^ a b "Barrow Company's Profits Soar by 11 Percent". Whitehaven News. http://www.whitehavennews.co.uk/barrow-company-s-profits-soar-by-11-per-cent-1.931938. Retrieved 5 March 2014. ^ "Jobs Hope as Fisher Booms". North West Evening Mail. 29 August 2007. Archived from the original on 26 September 2007. https://web.archive.org/web/20070926212059/http://www.nwemail.co.uk/news/viewarticle.aspx?id=536629. Retrieved 30 August 2007. ^ "About Us". Centrica Gas. http://www.centrica.com/index.asp?pageid=459. Retrieved 21 July 2007. ^ "ACTING LOCALLY, THINKING GLOBALLY". Britain's Energy Coast. http://www.britainsenergycoast.com/. Retrieved 25 June 2011. ^ a b "New £4 Million Wind Farm Operations Base in Barrow Seeks Skilled Workers". Scottish Power. http://www.scottishpowerrenewables.com/news/pages/new_4_million_wind_farm_operations_base_in_barrow_seeks_skilled_workers.asp. Retrieved 8 July 2014. ^ "Barrow in Furness". totaltravel.com. http://www.totaltravel.co.uk/travel/north-west/carlisle-cumbrian-coast/south-cumbria/travel-guides/Destinations/barrow-in-furness. Retrieved 14 August 2007. ^ "Half Term Fun for the Kids Just on the Doorstep". North West Evening Mail. 17 February 2007. Archived from the original on 26 September 2007. https://web.archive.org/web/20070926210914/http://www.nwemail.co.uk/news/viewarticle.aspx?id=467814. Retrieved 14 August 2007. ^ "November 2005 – Executive Committee Agenda" (DOC). Barrow Borough Council. November 2005. pp. 5. Archived from the original on 28 September 2007. http://www.barrowbc.gov.uk/docs/November%202005%20-%20Executive%20Committee%20Agenda.doc. Retrieved 14 August 2007. ^ "Cumbria Local Economic Assessment". Cumbria Observatory. http://www.cumbriaobservatory.org.uk/elibrary/Content/Internet/536/675/4356/40501155120.pdf. Retrieved 6 April 2013. ^ "Barrow Dock Museum". Enjoy Cumbria. BBC. http://www.bbc.co.uk/cumbria/enjoy_cumbria/places/barrow_dock_museum.shtml. Retrieved 14 August 2007. ^ "South Walney". Cumbria Wildlife Trust. http://www.cumbriawildlifetrust.org.uk/south-walney.html. Retrieved 2 September 2011. ^ "North Walney: what makes it special?". Natural England. http://www.naturalengland.org.uk/ourwork/conservation/designatedareas/nnr/northwalneywhatmakesitspecial.aspx. Retrieved 2 September 2011. ^ "Beaches". Barrow Borough Council. http://www.barrowbc.gov.uk/default.aspx?page=153. Retrieved 6 April 2013. ^ a b "Barrow-in-Furness Tourist Information". AboutBritain.com. Archived from the original on 28 August 2007. http://www.aboutbritain.com/towns/barrow-in-furness.asp. Retrieved 25 August 2007. ^ "South Lakes Wild Animal Park". Visit Cumbria. Archived from the original on 19 July 2011. http://www.visitcumbria.com/sl/south-lakes-wild-animal-park.htm. Retrieved 2 September 2011. ^ van der Zee, Bibi (7 August 2007). "Pitch Perfect, Part Two". The Guardian (London). Archived from the original on 2 July 2007. https://web.archive.org/web/20070702120519/http://www.guardian.co.uk/g2/story/0,,1838907,00.html. Retrieved 27 July 2007. ^ "Barrow Borough Council – Barrow Markets". Barrow Borough Council. 7 March 2007. Archived from the original on 24 August 2007. https://web.archive.org/web/20070824210003/http://www.barrowbc.gov.uk/Default.aspx?page=149. Retrieved 27 July 2007. ^ "Shopping and Town Centre". Barrow Borough Council. Archived from the original on 11 September 2007. http://www.barrowbc.gov.uk/Default.aspx?page=161. Retrieved 23 September 2007. ^ "Exploring the Area around Barrow-in-Furness". Barrow Borough Council. Archived from the original on 11 September 2007. http://www.barrowbc.gov.uk/Default.aspx?page=137. Retrieved 23 September 2007. ^ "24 Hour Shopping". Barrow. Furness.co.uk. Furness Enterprise Ltd.. http://www.barrow.furness.co.uk/barrow_lifestyle.asp?ID=L6. Retrieved 30 August 2007. ^ "Barrow Dock Museum". BBC Cumbria. http://www.bbc.co.uk/cumbria/enjoy_cumbria/places/barrow_dock_museum.shtml. Retrieved 16 July 2015. ^ "New build". Furness College. http://www.furness.ac.uk/new-build. Retrieved 26 June 2013. ^ "Furness Academy's £22.5 million vision to finally become reality". North West Evening Mail. http://www.nwemail.co.uk/news/furness-academy-s-22-5m-vision-finally-to-become-reality-1.913623?referrerPath=. Retrieved 26 June 2013. ^ "Barrow DG5 Flood Relief Scheme". waterprojectsonline.coml. http://www.waterprojectsonline.com/case_studies/2009/UU_Barrow_2009.pdf. Retrieved 8 July 2014. ^ "Multi million pound plans for Barrow police station revealed". North West Evening Mail. http://www.nwemail.co.uk/home/multimillion-pound-plans-for-barrow-police-station-unveiled-1.1065289?referrerPath=home. Retrieved 26 June 2013. ^ "Barrow town centre scheme on schedule". Capita Symonds. http://www.capitasymonds.co.uk/news__events/news/barrow_town_centre_scheme_on_s.aspx. Retrieved 26 June 2013. ^ "North Central Renewal Area". Barrow Borough Council. http://www.barrowbc.gov.uk/PDF/NorthCentralNRAAug2008.pdf. Retrieved 26 June 2013. ^ "Little-Known Barrow Plans British Fanfare for Princess Cruise Passengers". Cruise Critic. http://www.cruisecritic.co.uk/news/news.cfm?ID=3166. Retrieved 16 July 2015. ^ a b "Work on Barrow's Marina Vision Could Begin 'Within Three Years'". North West Evening Mail. http://www.nwemail.co.uk/news/work-on-barrow-s-marina-vision-could-begin-within-three-years-1.1161141. Retrieved 11 September 2014. ^ a b "BAE Systems Development will change Barrow skyline". North West Evening Mail. http://www.nwemail.co.uk/news/bae-systems-development-will-change-barrow-skyline-1.1122540. Retrieved 13 March 2014. ^ "Cumbria Prosperity Priorities Summit held on 2 April 2004" (DOC). North West Regional Assembly. Archived from the original on 27 September 2007. http://www.nwra.gov.uk/downloads/documents/imported/321089760698.doc. Retrieved 20 August 2007. ^ "Furness Enterprise – Fast Moving Consumer Goods". Furness Enterprise. Archived from the original on 29 September 2007. http://www.furnessenterprise.co.uk/furness_enterprise_sectors.asp?menuID=13&ID=IS6. Retrieved 20 August 2007. ^ a b c d "Key Figures for Economic Deprivation". Office for National Statistics. http://www.neighbourhood.statistics.gov.uk/dissemination/LeadKeyFigures.do?a=3&b=6275013&c=barrow&d=13&e=4&g=6411253&i=1001x1003x1004&m=0&r=1&s=1367432044166&enc=1. Retrieved 1 May 2013. ^ "Area: Barrow-in-Furness (Local Authority)". statistics.gov.uk. http://www.neighbourhood.statistics.gov.uk/dissemination/LeadTableView.do?a=3&b=6275013&c=barrow&d=13&e=9&g=6411253&i=1001x1003x1004&m=0&r=1&s=1367430603744&enc=1&dsFamilyId=2538. Retrieved 4 July 2013. ^ "170 Years of Industrial Change across England and Wales". Office for National Statistics. http://www.ons.gov.uk/ons/rel/census/2011-census-analysis/170-years-of-industry/170-years-of-industrial-changeponent.html. Retrieved 22 April 2014. ^ "2011 Census Analysis - Distance Travelled to Work". Office for National Statistics. http://www.ons.gov.uk/ons/dcp171776_357812.pdf. Retrieved 22 June 2015. ^ "Distance Travelled to Work - Workplace Population, 2001 (UV80)". Office for National Statistics. http://www.neighbourhood.statistics.gov.uk/dissemination/LeadTableView.do?a=7&b=6275013&c=barrow&d=13&g=6411253&i=1001x1003x1006&k=distance&m=0&r=1&s=1435005696594&enc=1&domainId=16&dsFamilyId=189. Retrieved 22 June 2015. ^ a b "Barrow area map" (Flash). Google Maps. Google. http://maps.google.co.uk/maps?f=q&hl=en&geocode=&q=Barrow+in+Furness&ie=UTF8&ll=54.173287,-2.999268&spn=0.205782,0.6427&z=11&om=1. Retrieved 26 August 2007. ^ Hetherington, Peter (19 May 2004). "Council gives thumbs up to 12 mile (19 km) bridge for Morecambe Bay". The Guardian (London). http://www.guardian.co.uk/uk_news/story/0,3604,1220030,00.html. Retrieved 9 March 2007. ^ "Barrow Chewits ad". BBC Cumbria. http://www.bbc.co.uk/cumbria/content/articles/2006/03/30/cumbriaonfilm_chewits_feature.shtml. Retrieved 17 July 2007. ^ "Go Anywhere On a Boat From Barrow". North West Evening Mail. http://www.nwemail.co.uk/memories/go-anywhere-on-a-boat-from-barrow-1.116441?referrerPath=home/2.4856. Retrieved 11 January 2015. ^ "Town chosen for cruise ship terminal". BBC. 22 July 2005. http://news.bbc.co.uk/1/hi/england/cumbria/4706191.stm. Retrieved 15 June 2007. ^ "Sports in Barrow and Furness". Barrow Borough Council. Archived from the original on 28 August 2007. http://www.barrowbc.gov.uk/default.aspx?page=151. Retrieved 19 August 2007. ^ a b "Barrow Football Club". BBC. http://www.bbc.co.uk/cumbria/sport/clubs/barrow/12_2003.shtml. Retrieved 19 August 2007. ^ "The FA Trophy". Napit.co.uk. Archived from the original on 23 August 2007. http://www.napit.co.uk/viewus/infobank/football/fatophy.php. Retrieved 19 August 2007. ^ "Walker wins it for hometown Barrow". TheFA.com. http://www.thefa.com/TheFACup/FACompetitions/TheFATrophy/Match%20Centre/Final%202010/080510. Retrieved 8 May 2010. ^ "Emlyn Hughes Obituary". The Daily Telegraph (London). 11 November 2004. http://www.telegraph.co.uk/news/main.jhtml?xml=/news/2004/11/10/db1001.xml. Retrieved 8 July 2007. ^ Pike, Richard; Poutianinen, Marko (1999). "Stevens, Gary 1981–88". Hall of Fame. ToffeeWeb. Archived from the original on 11 June 2007. http://www.toffeeweb.com/history/legends/Stevens.asp. Retrieved 8 July 2007. ^ "Player Report – Harry Hadley". EnglandStats.com. http://www.englandstats.com/playerreport.php?pid=424. Retrieved 21 July 2007. ^ "Player Profile – Vic Metcalfe". EnglandStats.com. http://www.englandstats.com/playerreport.php?pid=659. Retrieved 7 August 2007. ^ "Wayne makes Wembley History". North West Evening Mail (CN Group). 21 May 2007. Archived from the original on 26 September 2007. https://web.archive.org/web/20070926211331/http://www.nwemail.co.uk/unknown/viewarticle.aspx?id=500925. Retrieved 7 August 2007. ^ Dastafshan, Afshin. "Shana Haji, the first Iranian player in Scotland". Persian Mirror. http://www.persianmirror.com/Article_det.cfm?id=1367&getArticleCategory=42&getArticleSubCategory=4. Retrieved 21 June 2007. ^ Wilson, Andy (16 October 1997). "RUGBY LEAGUE: CARLISLE MERGER SIGNALS RETHINK". The Guardian (UK: Guardian Media Group): p. 27. "Now Carlisle's decision to move in with Barrow, a traditional hotbed of league where the amateur game remains as strong as ever, may be followed by a new club from South Wales entering Super League next year." ^ Wilson, Andy (16 October 1997). "RUGBY LEAGUE: CARLISLE MERGER SIGNALS RETHINK". The Guardian (UK: Guardian Media Group): p. 27. "CARLISLE and Barrow have decided to merge into a new club, Barrow Border Raiders, with repercussions extending well beyond the Second Division and Cumbria." ^ "Gardner out for indefinite period". BBC News. 27 April 2007. Archived from the original on 11 July 2007. https://web.archive.org/web/20070711031424/http://news.bbc.co.uk/sport1/hi/rugby_league/6599411.stm. Retrieved 21 July 2007. ^ Burke, David (11 March 2006). "A Welcome MAT for My Mate ADE; HUDDERSFIELD GIANTS V ST HELENS, TOMORROW, KICK-OFF 3 pm". Daily Mirror (UK: Mirror Group Newspapers): p. 57. "Mat, brought up in Barrow with Ade, said: "It's always been a dream of mine to play against my elder brother and this could be the time it becomes a reality. There's also a big chance we could be meeting head-on on the wing and that would be fantastic. I was pleased with my performance at Wakefield Trinity, I just hope Jon Sharp was pleased too – that's obviously the key to me playing against Saints."" ^ "Vickerstown Cricket Club, Walney". North West Evening Mail. 26 January 2006. Archived from the original on 26 September 2007. https://web.archive.org/web/20070926211104/http://www.nwemail.co.uk/goingout/viewarticle.aspx?id=326017. Retrieved 21 June 2007. ^ Fagan, Sean. "Rugby League History – Interview with Phil Jackson". RL1908.com. Archived from the original on 13 August 2007. http://www.rl1908.com/Legends/jackson.htm. Retrieved 4 August 2007. ^ "Fairway Hotel and Furness Golf Centre". Fairway Hotel. http://www.fairway-hotel.co.uk/index.php. Retrieved 6 April 2013. ^ Murray, Scott; Farnaby, Simon (2011). The Phantom of the Open: Maurice Flitcroft, The World's Worst Golfer. Yellow Jersey Press. ISBN 0224083171. ^ "About The Walk". Keswick to Barrow. https://www.keswick2barrow.co.uk/about.asp. Retrieved 3 May 2013. ^ "Explore the Heritage Index for England". The Royal Society for the Encouragement of Arts, Manufactures and Commerce. https://www.thersa.org/action-and-research/rsa-projects/public-services-and-communities-folder/heritage-and-place/England/. Retrieved 24 September 2015. ^ "Destination guide for Barrow-in-Furness". Enjoy England. Archived from the original on 11 July 2007. http://www.enjoyengland.com/destinations/find/englands-northwest/cumbria/barrow-in-furness.aspx. Retrieved 8 August 2007. ^ "Listed Buildings". Barrow Borough Council. Archived from the original on 28 September 2007. http://www.barrowbc.gov.uk/default.aspx?page=2758. Retrieved 16 August 2007. ^ "Conservation Areas in the Borough". Barrow Borough Council. http://www.barrowbc.gov.uk/default.aspx?page=1696. Retrieved 9 June 2013. ^ "Accommodation Type – Households, 2011". Office for National Statistics. http://www.neighbourhood.statistics.gov.uk/dissemination/LeadTableView.do?a=3&b=6275013&c=barrow&d=13&e=7&g=6411253&i=1001x1003x1004&m=0&r=1&s=1365528720388&enc=1&dsFamilyId=2570. Retrieved 9 April 2013. ^ "Thomas Round". Boise State University. http://diamond.boisestate.edu/GaS/whowaswho/R/RoundThomas.htm. Retrieved 7 August 2007. ^ "Glenn Cornick". The Official Jethro Tull Website. Archived from the original on 15 August 2007. https://web.archive.org/web/20070815135747/http://www.j-tull.com/musicians/pastmembers/glenncornick.html. Retrieved 7 August 2007. ^ "Metalist Magazine". http://www.metalist.co.il/interviewprivate.asp?id=141&lang=eng. Retrieved 10 January 2009. ^ Sue, David (23 June 2006). "Superstar DJ continues to Aim high". Manchester Evening News (Guardian Media Group). Archived from the original on 30 September 2007. https://web.archive.org/web/20070930165611/http://www.manchestereveningnews.co.uk/entertainment/music/rock_and_pop/s/216/216434_superstar_dj_continues_to_aim_high.html. Retrieved 7 August 2007. ^ "Keith Tyson Biography". British Council. http://collection.britishcouncil.org/collection/artist/5/19092. Retrieved 4 August 2007. ^ "Constance Spry / Florist, Author + Social Reformer (1886–1960)". Design Museum. Archived from the original on 6 August 2007. http://www.designmuseum.org/design/constance-spry. Retrieved 4 August 2007. ^ "Peter Purves in the Theatre". peterpurves.com. Archived from the original on 11 September 2007. http://www.peterpurves.com/inthetheatre.html. Retrieved 4 August 2007. ^ "Thomas the Tank Engine books". Storybook England. Archived from the original on 21 September 2007. http://www.storybookengland.com/authors.php?form_id=3413682892. Retrieved 25 August 2007. ^ "Álvaro de Campos's Geography". Hispania. http://www.cervantesvirtual.com/obra-visor/hispania--11/html/. Retrieved 1 January 2012. ^ "Career of Evil by Robert Galbraith review – a daft but enjoyable hunt for a serial killer". The Guardian. http://www.theguardian.com/books/2015/oct/21/career-of-evil-by-robert-galbraith-review. Retrieved 20 November 2015. ^ "CN Group – Publishing". Archived from the original on 7 April 2007. https://web.archive.org/web/20070407150107/http://cngroup.co.uk/publishing/index.html. Retrieved 10 June 2007. ^ "Abbey FM ceases broadcasting". Radio Today. 30 January 2009. Archived from the original on 5 February 2009. https://web.archive.org/web/20090205190014/http://radiotoday.co.uk/news.php?extend.4343.2. Retrieved 24 February 2009. ^ "BBC – Cumbria – Local Radio – The Barrow Office.". BBC. http://www.bbc.co.uk/cumbria/content/articles/2005/10/19/barrow_office_feature.shtml. Retrieved 16 August 2007. ^ Greenstreet, Rosanna (10 May 2006). "My Home: Dave Myers of the Hairy Bikers". The Independent (London: Independent News & Media). http://money.independent.co.uk/property/homes/article363011.ece. Retrieved 7 August 2007. ^ "Karen's sketch show opens". North West Evening Mail (CN Group). 11 June 2007. Archived from the original on 26 September 2007. https://web.archive.org/web/20070926212137/http://www.nwemail.co.uk/news/viewarticle.aspx?id=508863. Retrieved 25 July 2007. ^ Jardine, Cassandra (3 November 2003). "'Diabetes is not as simple as it appears'". The Daily Telegraph (London). http://www.telegraph.co.uk/global/main.jhtml?xml=/global/2003/11/03/hdiab03.xml. Retrieved 7 August 2007. ^ "Nigel Kneale". The Times (London): p. 71. 2 November 2006. Archived from the original on 11 February 2007. https://web.archive.org/web/20070211131713/http://www.timesonline.co.uk/tol/comment/obituaries/article622130.ece. Retrieved 8 February 2007. ^ Wylie, Ian (1 December 2006). "Victoria plays it straight". Manchester Evening News (Guardian Media Group). http://www.manchestereveningnews.co.uk/entertainment/film_and_tv/s/229/229723_victoria_plays_it_straight.html. Retrieved 5 August 2007. ^ "Top Award for Diary Drama Set in Barrow". North West Evening Mail. 27 March 2007. Archived from the original on 26 September 2007. https://web.archive.org/web/20070926211416/http://www.nwemail.co.uk/news/viewarticle.aspx?id=481129. Retrieved 14 August 2007. ^ "Treacle People microsite". Channel 4. http://www.channel4.com/learning/microsites/T/treacle/series2.html. Retrieved 10 May 2007. ^ Tarbuck, Martin. "The 10 Greatest Pies In Britain". Sabotage Times. http://sabotagetimes.com/life/10-greatest-pies-britain. Retrieved 17 July 2015. ^ "The Green's Green Food of Home". North West Evening Mail. http://www.timesandstar.co.uk/the-green-s-green-s-food-of-home-1.158252. Retrieved 17 July 2015. ^ "Upper crust: Writer scoffs his way to a winner in search for Britain's favourite pie". Daily Mirror. http://www.mirror.co.uk/news/uk-news/upper-crust-writer-scoffs-way-5282206. Retrieved 17 July 2015. ^ "Mystery that threatens cult soft drink". Birmingham Post & Mail Ltd. http://www.thefreelibrary.com/Mystery+that+threatens+cult+soft+drink.-a060206032. Retrieved 17 July 2015. ^ "Record Bid for Bottle of Sass". North West Evening Mail. http://www.newsandstar.co.uk/record-bid-for-bottle-of-sass-1.486029. Retrieved 17 July 2015. ^ "Sass in the Miz at Barrow Cocktail Bar". North-West Evening Mail. http://www.in-cumbria.com/sass-in-the-mix-at-barrow-cocktail-bar-1.1219999. Retrieved 17 July 2015. ^ "Restraint needed to restore cockles". North West Evening Mail. http://www.nwemail.co.uk/News/Restraint-needed-to-restore-cockles-5387c86f-f860-4811-b37e-c5f677214e2c-ds. Retrieved 17 July 2015. ^ "Cocklers' gangmaster made £100 a day". The Guardian. http://www.theguardian.com/uk/2006/jan/24/ukcrime1. Retrieved 17 July 2015. ^ "Butchers' campaign to protect sausage in Cumbria". North-West Evening Mail. http://www.nwemail.co.uk/News/Butchers-campaign-to-protect-sausage-in-Cumbria-6701513e-0a11-4974-a183-72c55fb022ee-ds. Retrieved 17 July 2015. ^ Davies, Caroline. "Barrow, capital of blue-collar Britain". The Guardian. http://www.theguardian.com/society/2008/oct/05/1. Retrieved 16 July 2015. ^ a b "Have your say on Barrow's flat cap image". North West Evening Mail. http://www.nwemail.co.uk/news/barrow/1.244620. Retrieved 6 October 2010. ^ "Barrow-in-Furness: The working class capital of Britain". The Mirror. http://www.mirror.co.uk/news/top-stories/2008/10/06/barrow-in-furness-the-working-class-capital-of-britain-115875-20779478/. Retrieved 6 October 2010. ^ a b "Indices of Deprivation 2015 Local Authority Summaries". Office for National Statistics. https://www.gov.uk/government/uploads/system/uploads/attachment_data/file/464464/File_10_ID2015_Local_Authority_District_Summaries.xlsx. Retrieved 6 October 2015. ^ a b "Indices of Deprivation 2010". Office for National Statistics. http://www.barrowbc.gov.uk/default.aspx?page=1572. Retrieved 11 September 2014. ^ "Find and choose services". NHS. Archived from the original on 22 July 2010. http://www.nhs.uk/servicedirectories/pages/servicesearch.aspx. Retrieved 22 July 2010. ^ a b c d e f "Barrow-in-Furness Health Profile". NHS. 2009. http://www.cumbria.nhs.uk/YourHealth/PublicHealthInformation/Barrow.pdf. Retrieved 22 July 2010. ^ "Key Figures for 2001 Census: Key Statistics". Office for National Statistics. http://www.neighbourhood.statistics.gov.uk/dissemination/LeadKeyFigures.do?a=7&b=276911&c=barrow&d=13&e=15&g=431960&i=1001x1003x1004&m=0&r=1&s=1279811101286&enc=1. Retrieved 22 July 2010. ^ a b "Cumbria Community Safety Strategic Assessment". Cumbria Intelligence Observatory. 2012. http://www.cumbriaobservatory.org.uk/elibrary/Content/Internet/536/671/4674/5172/41260152144.pdf. Retrieved 9 September 2014. ^ a b c d e "Crime statistics for Barrow-in-Furness". Cumbria Constabulary. 2013. http://www.mirror.co.uk/news/uk-news/crime-statistics-for-barrow-in-furness-3217045. Retrieved 9 September 2014. ^ "Schools and Education". barrow.furness.co.uk. Furness Enterprise. http://www.barrow.furness.co.uk/barrow_schools.asp?ID=L2. Retrieved 17 August 2007. ^ "Programmes of Study". Barrow Sixth Form College. Archived from the original on 27 September 2007. http://www.barrow6fc.ac.uk/About/ProgrammesOfStudy.asp?Area_Title=About. Retrieved 18 August 2007. ^ "School Leavers". Furness College. Archived from the original on 22 August 2007. http://www.furness.ac.uk/index.php?option=com_content&task=section&id=2&Itemid=2. Retrieved 18 August 2007. ^ "University Education". Furness College. http://www.furness.ac.uk/course-index/university-education. Retrieved 22 July 2015. ^ a b "Libraries and Archives". Barrow Borough Council. Archived from the original on 27 August 2007. http://www.barrowbc.gov.uk/Default.aspx?page=163. Retrieved 18 August 2007. ^ "Cumbria County Council (Barrow)". Familia. Archived from the original on 6 September 2007. http://www.familia.org.uk/services/england/cumbria_barrow.html. Retrieved 18 August 2007. ^ "Museum History" (Flash). Dock Museum. Archived from the original on 5 August 2007. https://web.archive.org/web/20070805222430/http://www.dockmuseum.org.uk/museum_history.htm. Retrieved 18 August 2007. This page uses content from the English language Wikipedia. The original content was at Barrow-in-Furness. The list of authors can be seen in the page history. As with this Familypedia wiki, the content of Wikipedia is available under the Creative Commons License.